I hold my painfully dry hands up and say that I had completely neglected my hands through the winter and eventually this completely and utterly paid a toll on the condition of my hands. I'd actually go as far as to say that they were in the worst condition I've ever seen them. They were dry, chapped, cracked and generally really sore to the point were as I was even questioning if I was developing eczema. 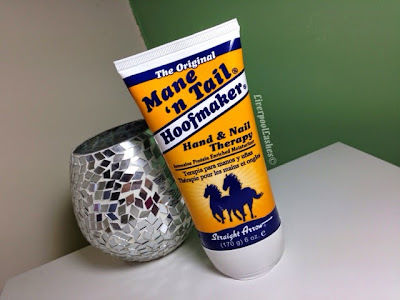 The first time I started using this Mane 'n' Tail Hoofmaker Hand & Nail Therapy, my hands were so bad that it did ever so slightly sting them but it did soon go away. I swear to you that the moment you apply this cream your hands feel that little bit better and soothed. The scent is fairly neutral, nothing too girly but more of a clean fragrance. It sinks in really quickly and doesn't live them sticky at all. I do feel that somehow it leaves the thinnest protective layer over them which is hard to describe but this really is a fantastic product. The bottom line is, after around five days suffering with extremely sore hands and then using this product they felt so much better and almost completely healed. I have tried so many hand products and this to me is the ultimate hand cream that I would recommend to anyone.